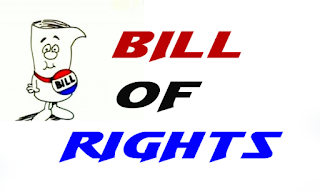 The U.S. constitution provides fundamental rights to individuals in the Bill of Rights. Though these were not embodied in the original constitution, however, they were inserted in it in the shape of first ten amendments. The Bill of Rights, i.e., the first ten amendments, were proposed in 1789 and ratified in 1791. This amendment forbids Congress to set up or in any way provides for an Established (Official ) Church. It has been interpreted to forbid Government endorsement of or aid to religious doctrines. Congress may not pass laws limiting worship, speech or the press or preventing people from eating peacefully. Congress may not keep people from asking the Government, State & Federal, for relief from unfair treatment. Note: All the rights protected by this amendment have limits e.g, the guarantee of freedom of religion does not mean that the Government must allow all religious practices. The second amendment guarantees the right to keep and bear arms to the citizens of United States for their defense. This amendment prohibits only the National Government for limiting the right to carry weapons. The amendment was adopted so that Congress could not disarm a State Militia. “No soldier shall, in time of peace be quartered in any house, without the consent of the owner, nor in time of war, but in a manner to be prescribed by law”. The third amendment guarantees the freedom to the citizens of the United States from billeting of the soldiers. This amendment grew directly out of an old complaint against the British, who had forced people to take soldiers into homes. The fourth amendment provides the people shall be immune from unreasonable searches & seiezures without a search warrant. Seizures and searches can take place under very special circumstance, e.g., if someone is suspected of serious offence or someone is carrying on activities prejudicial to State Security. This amendment does not forbid legal authorities to search, to seize goods or to arrest people. It simply requires that in most cases the authorities obtain a search or arrest warrant from a judge by showing the need for it. Note: The S.S. Supreme court has held that evidence obtained in violation of the fourth Amendment may not be admitted in evidence in a criminal trial. Ø A capital a crime is one punishable by death. Ø An infamous crime is one punishable by death or imprisonment. Ø A grand jury is a special group of people selected to decide whether there is enough evidence against a person to hold a trial. Ø The Fifth Amendment guarantees that no one has to stand trial for such a federal crime unless a Grand jury has accused him. A person cannot be tried twice for the same offence by the same Government, but he may be tried a second time if a jury cannot agree on a verdict, if a mistrial is declared for some other season or if he requests a new trial. Ø The amendment also guarantees that a person cannot be forced to testify against himself. Ø The statement that no person shall be deprived of life, liberty or property without due process of law expresses one of the most important rules of the constitution. The phrase expresses the idea that a person’s life, liberty and property are not subject to the uncontrolled power of the Government. Ø The amendment also forbids the Government to take a person’s property for public without fair payment. a. All the person charged with criminal offences shall be entitled to speedy and public trial. c. All the accused persons shall be entitled to get the assistance of Counsel for their defense. A person accused of crime must have a prompt, public trial by an open-minded jury. The requirement for a speedy and public trial grew out of the fact that some political trials in England had been delayed for years and then were held in secret. Accused individuals must be informed of the charges against them and must be allowed to meet the witnesses against them face to face. Otherwise, innocent persons may be punished if a Court allows the testimony of unknown witnesses to be used as evidence. This amendment guarantees that individuals on trial can face and cross-examine those who have accused them. They may be able to show that their accusers lied or made a mistake. Finally, accused person must have a lawyer to defend them if they want one. Note: If a criminal defendant is unable to afford a lawyer, the Supreme Court has held that one must be appointed to represent the accused individual. “ In suits at common law, where the value in controversy shall exceed twenty dollars, the right of trial by jury shall be preserved, and no fact tried by a jury shall be otherwise re-examined in any Court of the United States, than according to the rules of common law”. The seventh amendment provides a right to trial by jury for law suits involving anything valued at more than twenty dollars. The framers of the constitution considered the right to jury trial extremely important. In the sixth amendment, they provided for jury trials in criminal cases. In the Seventh Amendment, they provided for such trials in civil suits where the amount contested exceeds twenty dollars. Note: The amendment applies only to Federal Courts but most State constitutions also call for jury trials in civil cases. “Excessive bail shall not request, nor excessive fine imposed, nor cruel and unusual punishments inflicted”. The eighth amendment forbids setting of excessive bail for persons involved in criminal offence. It also prohibits the levy of excessive fines and cruel punishment. The U.S. Supreme Court also held that ‘Bail, fines and punishments must be fair and human. “The enumeration in the constitution of certain rights shall not be construed to deny or disparage other retained by the people”. The ninth amendment provides that the rights not mentioned in the constitution shall continue to be enjoyed by the people. Some people feared that the listing of some right in the Bill of Rights would be interpreted to mean that other rights not listed were not protected. This amendment was adopted to prevent such an interpretation. The tenth amendment was adopted to reassure people that the National Government would not swallow up the States. It confirms that the States or the people retain all powers not given to the National Government, e.g., the states have authority over such matters as marriage and divorce. But the constitution says that the Federal Government can make any law necessary and proper to carry out its specific powers. This rule makes it hard to determine the exact rights of states. Fundamental rights are available to all the citizens in all the states, and protected against infringement by the Federal Government, Congress and also against State action. They were inserted in it the shape of frist ten amendment, known as the Bill of Rights, proposed in 1789 and ratified in 1791.